Crankbaits, minnows and plugs are among the most versatile and successful styles of fishing lure - yet most of us use them to 10% of their potential at best! That's a lot of missed fish, but it's also a fantastic opportunity for immediate improvements in catch rates simply by understanding these lures better and using them effectively! With the help of this eBook you can start doing that today! Part of the reason that so few fisherfolk use this style of lure effectively is that the range of lures (which all work differently and require different techniques) is bewildering! And, crankbaits are still evolving quite rapidly, with lure companies constantly bringing new ideas to a hungry market. The evolution of crankbaits has resulted in numerous specialisations, such as square bills, lipless, deep divers, broke-backs and jerkbaits, to name just a few. We now have crankbaits that will catch fish under almost any circumstances. But how many people know how to use them all? It's a massive confusion! What crankbait do I use and when? What color? How do I fish it? This eBook answer those questions by methodically discussing each crankbait style and providing simple, easy to follow tips for using them. It provides examples of suitable lures for each of the techniques described, saving you time and money buying the wrong crankbaits for your fishing needs. 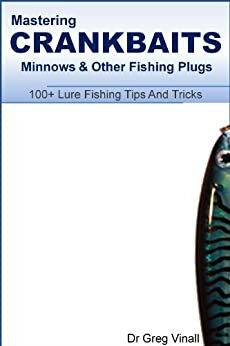 It provides dozens of facts, tips and techniques that will help you catch fish whether you fish from boat or bank, cast or troll in fresh or saltwater, for all types of fish. The bait styles covered include floating, sinking and suspending, lipless, jointed, square bill, shallow, medium and deep diving. I trust that this eBook will allow you to go forward armed with a better understanding of crankbaits and with renewed confidence for using them. As we all know you will always catch more when you fish with confidence! Excellent detail on all facets of crankbaits. Describing each type in detail and how and when to use it. After reading this, my other books seem like elementary school comics. Get it. Not terribly well written, and not terribly useful. 5.0 out of 5 starsWritten By A Genius! This book has some valuable insight for a person that has actually done years of fishing. I also got some affirmation in some areas where I felt I was doing correct actions with my own experiences.